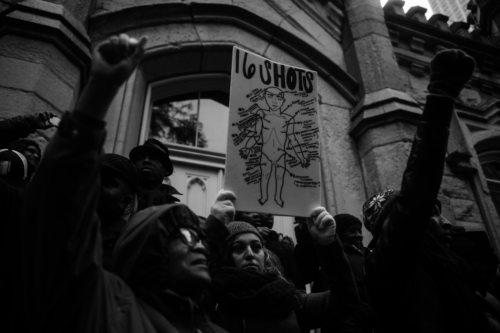 The following is a reflection on the first anniversary of last year’s Black Friday protests over the police killing of Laquan McDonald. During the protest, marchers shut down the Magnificent Mile portion of Michigan Avenue, costing stores between twenty-five and fifty percent of their Black Friday revenue according to a Tribune estimate. The author, Loren Taylor, was born and raised on the South Side. He spent over twenty years living and traveling in Europe as a singer-songwriter before returning to Chicago in 2010. He currently volunteers with community organizations, including the Community Peace Surge and the Chicago Anti-Eviction Campaign. I get there to find Rev. Jesse Jackson, Representative Bobby Rush, etc., standing in front of the Tribune Building, lining up their march. Father Michael Pfleger and what appear to be his bodyguards join them. Then the Red, Black, and Green Flag (in this narrative, my name for the contingent of grassroots organizers and protesters grouped around a flag with red, black, and green stripes, the familiar symbol of Black Unity and Power) makes its way through and around those already assembled, stopping in front of the banner that had been intended to lead the march. To my right The Flag is marching down Michigan Avenue. To my left is the Old Guard, watching The Flag move away. Maybe I imagined it, but I seem to remember Rev. Jackson looking me right in the eye. 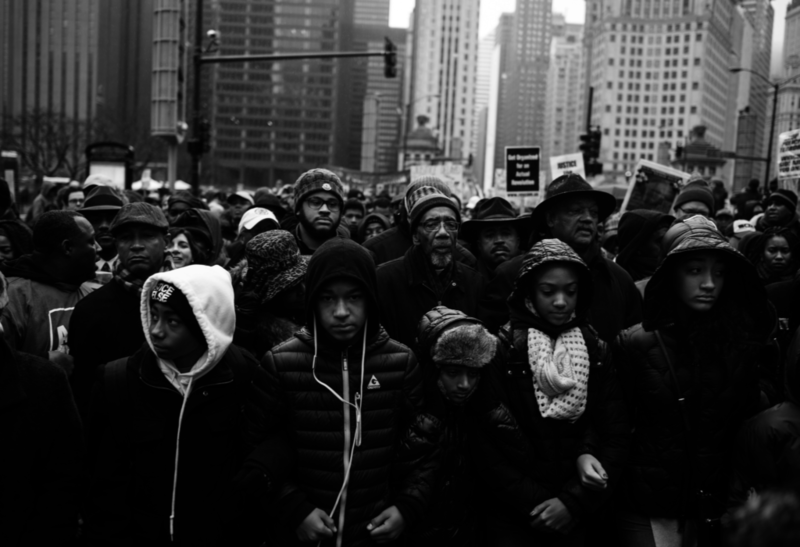 If it’s melodramatic to describe that moment in the middle of Michigan Avenue as my living metaphor for the generation gap wedging itself into Black Chicago’s social justice movements, too bad. Close enough—a quick decision was needed here, no time to intellectualize. Either I was with the old or the new. I turn to my right and hurried to catch up to the The Flag. Whatever we were chanting, all I remember hearing was “Black Power!” and watching startled employees pour out of the smaller shops along Michigan Avenue, most with mouths wide open. As we marched down the middle of the street, I kept looking back, waiting for The Banner (my name for the aforementioned old guard of preachers and representatives) to start marching. No. Don’t do this. Don’t keep standing there. The unity part of The Flag’s “Black Power, Black Unity” sentiment had a hard time getting its bearing that afternoon. It was obvious: The Banner was going to wait until The Flag reached Water Tower Place. Maybe TV would pretend The Flag wasn’t there. Strangely, Channel 5 later made it look like The Banner went first, followed by the “young ones”—Mark Carter, JR Fleming, Jeffery Muhammad, The Flag, etc. Shows just how long Rev. Jackson, Rush, and the rest have been around when Carter and Fleming are the Young Ones (neither are very young so much as younger than…). Representative Danny Davis had to walk from the Trib Building to the Water Tower using a cane. There’s a lot of talk about an Elders vs. Millennials rift within Black America, inviting the question: has anybody seen Generation X? It is not silly to include medical science in any discussion of generational dynamics. The retirement age is sixty-five years-old because fifty years ago, most people dropped dead in their seventies. My father outlived his father by a decade. My eighty-three year-old mother will be around for a long time, possibly a good twenty years more than either of her parents. Many prominent elder Black leaders would be loath to admit their personal care takes up organizational resources, but the model of the charismatic figure who is “important to the movement” has allowed many leaders to simply continue on and on, with no real imperative to build for what happens after they’re gone. Younger people around them seeking the experience needed to assume leadership roles are seen as ingrates and usurpers. This is certainly a blanket statement, but the overall effect is a void in Black leadership that casts serious doubt on where we’ll be twenty or fifty years from now. This has nothing to do with particular individuals, their missions, organizations, or the endless discussions of whether Black leaders do enough for Black people. The simple fact is: although people live longer in the twenty-first century, they still won’t live forever. Today’s societies change so fast that the old model of “grooming” successors would likely produce inept leaders with outdated skillsets, unable to gain any real experience until time finally catches up with ever-advancing technology that gives mentors the ability to retain control, as long as a pen can be lifted to sign a document or a voice raised to give a directive. These days, leaders have to groom themselves, and their predecessors have to sit back and wait for conditions—not connections or predetermined agendas—to decide who their successors will be. Yeah, you say, all heads of major (read: white) organizations do the same. Big whoop. But running a social justice organization you built (or helped build) is not the same as, say, running a large corporation. Not that it’s easier, but lot of what of social justice leaders actually do is make personal appearances, much the same way a politician keeps his face among constituents. Most actual tasks get delegated to subordinates. Then think of them as politicians, you say. Again, different. Elected officials have a legal mandate with prescribed duties, confirmed by the voting process. Many Black leaders have the self-directed luxury of essentially being “popes in their own pulpits,” responsible most times to funders more than the people they intend to serve. Perhaps this could also be said for today’s bought-and-sold politicians, but again, not the same. I have no right to tell those I’ve looked up to for years how and when to stop actively pursuing their life’s work. But if I don’t like what the governor or the mayor is doing, I’m compelled as a voter and citizen to tell them to sit down. There are certainly a lot of Black people in their forties and fifties doing outstanding work. But can you name any forty-five or fifty-year-old Black leader who enjoys the same profile our elders did when they were middle-aged? Our heroes from the Civil Rights days rose during a time when Black elders were often too weak or afraid to act. New Black leaders don’t have the same vacuum to fill as their predecessors, but it won’t help if they’re expected to merely be Mini Me-copies patiently parked in subordinate service to their mentors. Prince Charles doesn’t really care if Queen Elizabeth lives to be 107—he’ll never make a meaningful decision anyway. Transition of influence to a new generation of Black leaders is another thing altogether. I don’t have time to wait for the twenty-five-year olds to find themselves. Most of our elders won’t have to reach back that far to see who’ll come next. The next generations (I use the plural, because it appears that millennials and the too-young-for-Vietnam-too-old-for-hip-hop tribes will have to grow in tandem, as the last of the Baby Boomers have just started Social Security, and sixty-five is way young these days) of Black leaders have also have to quit looking for a reason to get mad at their elders before stepping up. I know it’s popular to say numbers show Black people are worse off than ever, proof Black leaders of the past have failed us. I’ll always know the reason I could confidently spend twenty years traveling the globe is because I grew up seeing Rev. Jackson taking care of business on the world stage. People half my age just seem a little stronger than most folks did when I was as old as today’s millennials are. Maybe I just want to think civil rights is part of a slow progression that gives all Black generations that follow more strength than we would have had otherwise. At last year’s protest, my no-turning-back feeling was compounded when the Old Guard attempted to hold court in front of the old Water Tower. Fleming rushed to the spot, bullhorn blasting. I went right behind him. I have no idea what we were yelling, but I was determined that, this time, permission was not required. We weren’t going to make this painless. Not for The Magnificent Mile. Not for Rahm. Not even for the elders. Let’s not get this twisted. The term “general public” is code for “white people.” Now, a question: Would the organizers of the Black Friday protest have ever considered, even for a moment, disrupting the most lucrative shopping day of the year if they were even a little bit concerned how the general public would react? It’s interesting that über-right wing websites like breitbart.com probably published more photos of the protest than did corporate media. Most likely Breitbart thought showing waves of (mostly) Black protesters preventing shoppers from exercising their rights as free Americans to spend their hard-earned money was certain to provoke indignation. By now the reader might have gotten the impression that Fleming, Carter, The Flag (and although he was marching with the Old Guard, we can’t forget Jedidiah Brown), and I were the only ones at the protest who weren’t old enough to qualify for Medicare. They might also think that marching with The Flag (instead of waiting behind The Banner) was reserved for street organizers too immature, unsophisticated, or merely too resentful to follow the established leadership. I don’t remember if anyone was standing behind me when I picked up Fleming’s chant of “Indict Rahm!” blaring through the bullhorn. I’m sure it took more than two of us to push the preachers off those steps. I remember Rev. Jackson’s eyes again, or maybe I was really trying to make eye contact with him. No backing out of this now. I give Rep. Danny Davis credit for staying with Black Lives Matter after Rev. Jackson and his crew walked away. Again, I look up and there’s Jedidiah, this time with, “Hey, all the media gonna report is the disunity.” I replied, “We’ve gotta stop always caring what they think.” Later, watching TV, I saw another preacher derisively telling the reporter something about “saboteurs being a problem.” Like we were a group of wasps disturbing his Fourth of July picnic. I then went inside Water Tower Place for a few minutes. Hell, it was damn near December and I was cold. Journalist that I am, I also wanted to see first-hand what effect the blockades were having. The fact the protest had not reached the back entrance (opposite the Ritz Carlton hotel) may have confused the police. Frontline officers were still required to allow entry to those hearty souls still able to adhere to their gift-buying agendas , but had decided not to let anyone exit. Water Tower Place quickly transformed into a reality TV show set as most people—even those intending to shop—predictably became obsessed with how and when they could get out of the building. As a result, no one paid me much attention as I walked through the stores. Anything short of shoplifting would likely not have drawn any notice. All eyes were looking at the windows. If I had to explain it, I would say the protest made shopping (or serving shoppers) look a bit silly. No one was preventing the people who had made it inside the mall from doing what they had come to do—buy stuff—but they weren’t. You could tell the few people browsing weren’t buying. Cash registers remained silent. If my recollections of ear-hustled conversations between floor staff inside the department store are any indication, the primary concern of the merchants was the mob of vandals and looters they felt certain would ransack the mall if the protest reached the interior. I watched a trio of anxious-but-resolute floor managers staring at the metal gates that had already dropped in front of the store’s entrance. “They can’t get through there. Can they?” The managers couldn’t see the line of policemen on the other side of the metal gates likely to start beating the crap out of anyone who came too close to the doors. I thought: if any protesters come in thru the store’s back entrance like I did, better they ditch the “Capitalism Kills!” signs before reaching the fragrance section. When I was warm enough to go back outside, I psyched myself up for reentry into the elements by sitting for a minute on a bench near the back entrance. A Black woman in her forties asked me for directions to State Street. She and her preteen daughter were on an out-of-town shopping trip and wanted to window-shop. I explained it would be a long walk, longer still due to congestion caused by the protest. No problem, she said. Her daughter was curious to see what all the fuss was about. Once I made it back to the Michigan Avenue side of Water Tower Place, the protest seemed to have morphed into a mix of street festival and guerrilla theatre. It was much easier to see that the racial mix of protesters was predominantly but not exclusively Black, both in number and messages propounded. The two larger groups clustered around the The Flag and The Banner had broken up into smaller cells; some marched up and down Michigan, others blockaded the storefronts, scattered individuals banged on drums, waved flags, passed out leaflets. Police kept a watchful but careful distance, likely knowing the time they spent containing the handful of disruptors would be more worrisome than the protest itself. I felt compelled to give a report to someone. I found Maze Jackson—he had addressed The Flag group when we first assembled in front of Water Tower Place. 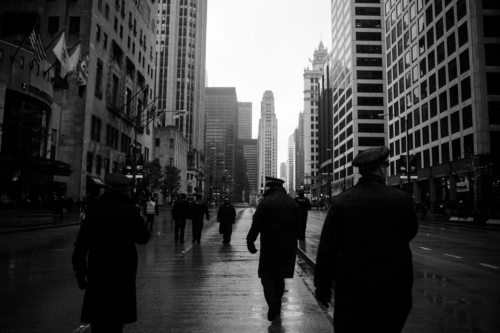 He now stood in the middle of Michigan Avenue a block or so down from where the day had started, surveying the back-and-forth flow of protesters and observers. It was really too noisy to have a conversation, so I kept it brief, highlighting the fact that few shoppers were buying anything. He smiled. Both sides of the street were lined with out-of-towners watching the protest as if they were enjoying a parade. TV news must have dug hard to get those clips of irate holiday shoppers to broadcast that evening. Most bystanders sounded like they could relate. “The police shot that kid, what, sixteen times?” they’d say. My work was done here. Click here for a postscript on photographs and the meaning of invisibility. We have marched for 400 years. On to the slave ships. Up from the South to the North. Today the news of the “march” gets more attention than the follow up. People…. “yes” Black people in particular including the old and the young, leadership of the church and the leadership in the street are likely shopping from their phones giving the retail stores much higher revenues as the chants fade. The unexpected repercussion is that this give “White Business Managers/Owners” more justification to lay-off more folk. When will we see that WE have more people power on the South and West Sides of the former Cook County, IL (DuSable County, IL) than it would take to build an economic engine that can inspire an education, entertainment, social and restorative change for at least 2.7 Million people of color right away and for generations to come. If we only new that WE were free.